As part of the Bureau of Mines health and safety research program, a short-range locator system, capable of locating miners who have become trapped following a mine accident, has been devised. The system consists of a light-weight, low-power radio transmitter incorporated into a miners cap lamp battery and a directional receiver carried by rescuers. Prototype transmitters have been constructed, and the propagation of their signals has been investigated. The detectability of the signal in underground coal mines has also been investigated. 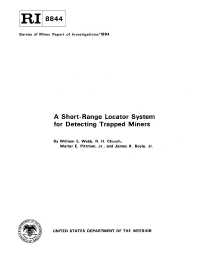 This research indicates that a short-range location system would serve as an economical and practical means of locating miners from within the mine following an accident. Research at the Tuscaloosa Research Center is carried out under a memorandum of agreement between the Bureau of Mines, U.S. Department of the Interior, and the University of Alabama.